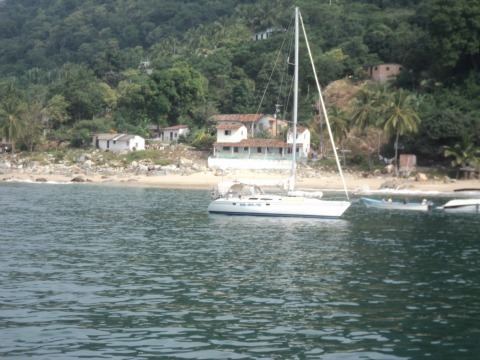 Playa Las Animas is a secluded beach village on the south side of Banderas Bay. Here is where you can get away from the city to relax. Many boats stop by to enjoy one of their delicious restaurants. 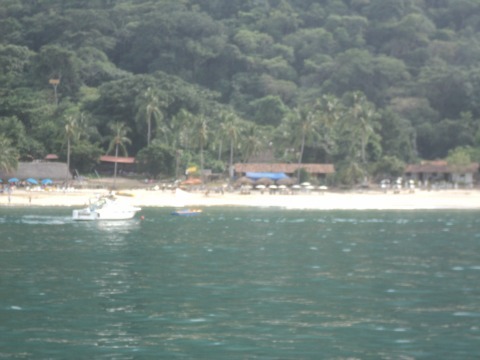 You do not need to take a Puerto Vallarta tour boat cruise to get here unless of course you want to. Instead, you can always just catch a water taxi. The water taxi's leave from the pier at Los Muertos Beach. They are very reasonably priced and fun from the time you put your life jacket on. On your way to Playa Las Animas, you will pass by Los Arcos which is the most popular tourist destination in Puerto Vallarta and your guide will give you valuable information about this and other sights along the way. Here's a little tip for you. Wear shoes you do not mind getting wet because depending on which water taxi you choose, you may get let off a foot or two from the shore. Some taxi's do offer pier to pier service though. Once there, you will find yourself in the tiny little village of Playa Las Animas. Now you can spend your day just relaxing on the beach. Or, if you want to snorkel, swim, scuba dive or go kayaking, it is all offered here as well. If you feel like taking a little stroll, take a walk down the beach to the line of rocks in the Bay. Once there you will be in a location called Little Horse or El Caballito. The shallow depths and crystal clear waters here make it perfect for seeing the tropical marine life. You will also find many locals with iguanas and snakes strolling the beaches here. They will ask if you would like to take a photo with them. Please remember this is how they make a living. If you do take a photo with them, please remember to give them a little something. You may also be serenaded, once again the person is working and will expect a tip. Feel free to say "no gracias" and he will go away. If you get hungry, there are some different restaurants to choose from. On our last visit there we ate at a really nice one but for the life of me, I can not remember the name of it... One reason I liked it there is because they offered to make me a cheese quesadilla even though it was not on the menu, and I am a vegetarian. The second reason is because they actually had a Corona beer in a bottle. I know that sounds funny and all since we were in Mexico but we had been in Puerto Vallarta for almost a week and it was the first time that I had found one. Taking a day trip to Playa Las Animas is a nice and cheap way to explore some secluded beaches of Puerto Vallarta and meet some locals without paying the price of a guided tour. When you are finished here don't forget the water taxi's also go down to Yelpa and Quimixto.